To my surprise, India did not feel overwhelming or foreign at all. My visions had prepared me well. I went to the AID INDIA office and joined the crew. Within a day I was taken to Pondicherry on a long van ride filled with singing and laughing Buddhist monks. I felt a connection with a particular monk – Subogam, an orphan. He was a beautiful young man from Burma with a huge smile and some of the kindest eyes I had ever seen. Daniel, an old monk, had taken Subogam under his wing. 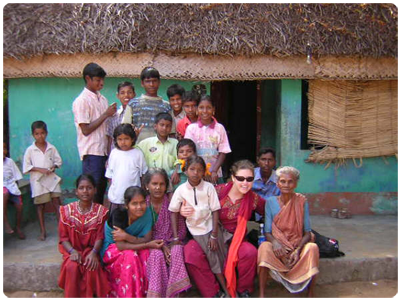 They had come to southern India to help with the tsunami survivors, too. At midnight, twelve of us were welcomed into an empty room with a marble floor and many mosquitoes. We used our sleeping bags as pillows, and the floor was the hardest “bed” I had ever slept on. I lay down near Daniel.